Premium Ashwagandha Root Powder. Certified Organic, Vegan, Kosher, Gluten Free. Packaged and Quality Tested in the USA in our own dedicated Vegan, Gluten Free, Kosher, Certified Organic, NSF Registered Facility. Ashwagandha (Withania somnifera), also known as Indian Ginseng, is an ayurvedic herb that can be traced back to around 6,000 B.C. 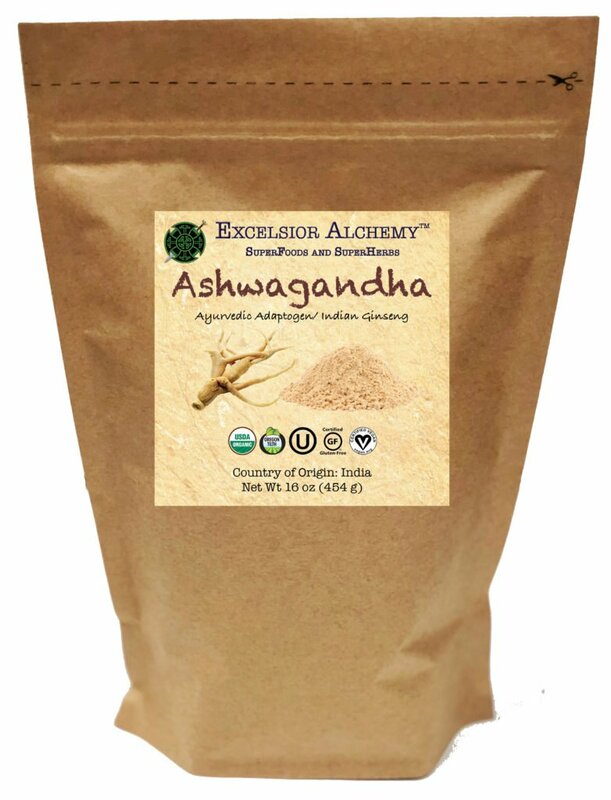 Ashwagandha is one of the most powerful adaptogenic herbs of the tradition. Ashwagandha is slightly bitter and can easily be added to smoothies, elixirs, drinks, desserts, and other culinary delights to upgrade and enhance the experience. 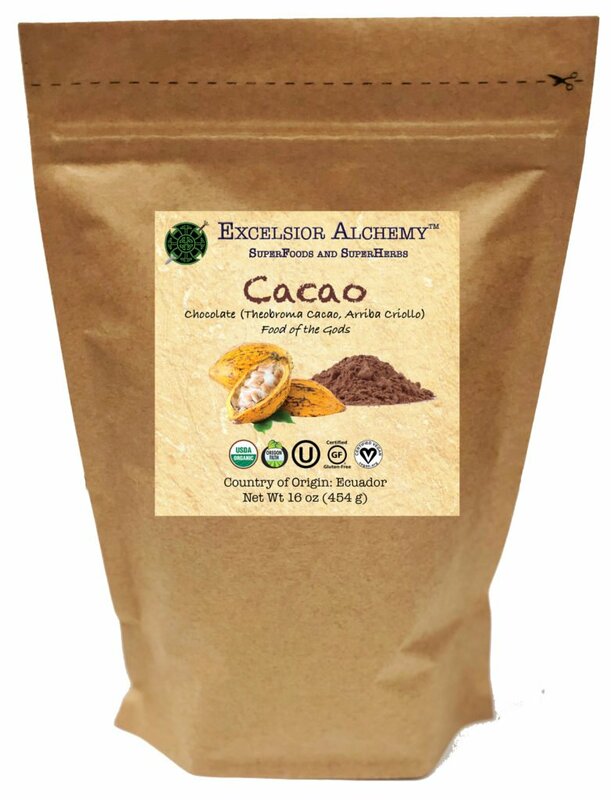 Premium Heirloom Cacao Powder. Certified Organic, Vegan, Kosher, Gluten Free. Cacao powder is the nutrient-rich extract of pure chocolate beans. Our heirloom cacao is grown wild in high-elevation volcanic soil and ethically harvested using traditional hand-pick methods and sun drying process. It is one of Nature’s fantastic superfoods. Cacao can be added to smoothies, hot or cold drinks, elixirs, desserts, and breakfast delights to add an intense, raw chocolatey flavor to your amazing creations. Premium Chaga Mushroom Powder. Certified Organic, Vegan, Kosher, Gluten Free. Chaga (Inonotus obliquus) is a magical birch tree polypore from northern cold climates. Chaga is a traditional herbal sacrament used around the world and is a well-studied, and respected adaptogen. Our specially wildcrafted Chaga 1:1 extract has a beautiful rich black/ brown pigmentation indicating a complex phytochemistry. 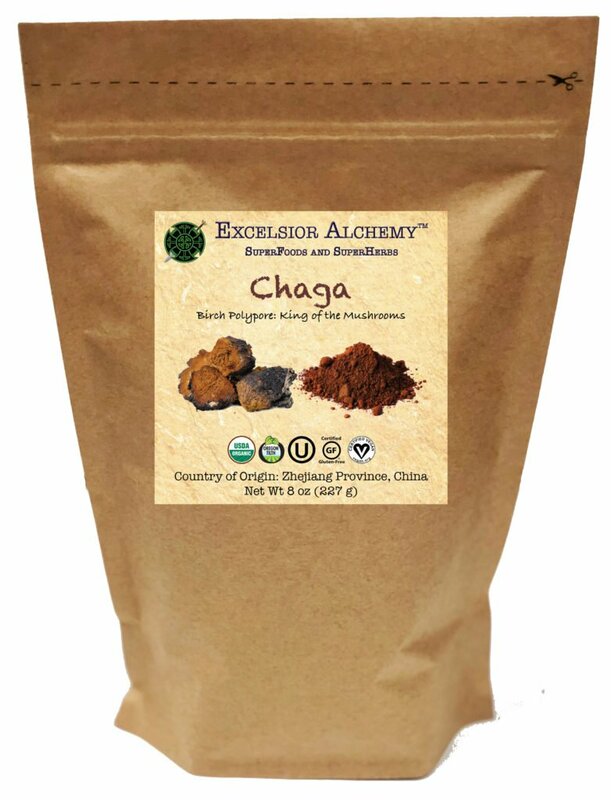 Chaga adds a pleasing rich flavor to teas, foods, and beverages. Premium Carob Pod Powder. Certified Organic, Vegan, Kosher, Gluten Free. Carob powder is a delicious, non-stimulating, lightly-roasted superfood made from the ground-up pods of the carob tree (Ceratonia siliqua), native to the Mediterranean region. The use of carob dates back 4,000 years to ancient Greece. Carob can be added to smoothies, warm or cold beverages, and desserts to give a malty, sweet, nutty flavor. Lucuma fruit is a creamy, sweet, nutrient-rich superfruit of the Pouteria lucuma tree native to Andean valleys of Peru. This fruit has been cultivated since 200 A.D. and grows at an altitude of 4,500 to 10,000 feet. Known locally as the “Gold of the Incas,” this fruit adds delicious fun to smoothies, beverages, milks, desserts, and breakfast delights. Premium Peruvian Maca Root Powder. Certified Organic, Vegan, Kosher, Gluten Free. Maca is an ancient Peruvian superfood root (Lepidium meyenni) that is cultivated by Incan farmers at altitudes of 11,000+ feet. Maca is a powerful, nutrient-dense adaptogen and has a rich history of use dating back over 1,300 years. Maca adds a peppery, malty flavor to smoothies, teas, chocolate, and desserts. Premium Moringa Leaf Root Powder. Certified Organic, Vegan, Kosher, Gluten Free. Moringa (Moringa oleifera) is from the leaves of The Miracle Tree that has a history of use dating back to 2,000 B.C. Moringa is a rich nutritional powerhouse and a versatile herb that can be enjoyed daily. The powder can be infused into teas, herbal elixirs, and added to smoothies, soups, dressings, and even desserts. Premium Reishi Mushroom Powder. Certified Organic, Vegan, Kosher, Gluten Free. Reishi (Ganoderma lucidum), a medicinal mushroom, has a history in Traditional Chinese Medicine (TCM), referred to as Ling zhi, or spirit, dating back thousands of years. This reishi is wood-grown and a 1:1 extract. In TCM, reishi is said to support all three treasures (Jing, Chi, and Shen) and has the most tonic action on Shen (spiritual radiance). Premium Turmeric Powder. Certified Organic, Vegan, Kosher, Gluten Free. Turmeric (Curcuma longa) is an ancient rhizome that has been revered in the Ayurvedic tradition for 4,000 years. The intense yellow-orange color indicates a rich nutritional phytochemistry. Turmeric powder is very versatile and can be used in sweet or savory dishes, smoothies, hot chai’s and teas, soups, dressings, and even desserts.